So what is turnkey? Will it cost me more? I’m a self-builder, why would I need turnkey? These are just some of the questions we’re regularly asked about our turnkey solution. So let us explain what turnkey is and the benefits of working with a turnkey company like ours. When you decide to build your own home you have three main options – self-build, self-managed and turnkey. If you self-build you do it all yourself; if you opt to self-manage you source and co-ordinate everything yourself. Turnkey is taking on a company that does everything for you under one roof, this is the solution we offer at Complete Oak Home. Building your dream home is challenging. For anyone without previous experience it can be a stressful experience having to deal with everything from handling planning issues to sourcing suppliers and getting the best value for money. Anyone who has ever watched a TV self-build show will know there’s a lot to learn when you build your own home and how easily costs can escalate and problems arise. Whether you’re doing it all yourself or self-managing your build, the dream can all too easily turn into a financial and emotional nightmare. Choosing to work with a turnkey company like us significantly reduces those risks and gives you peace of mind. Your build will be managed by a team of experts who work together on your project, ensuring a joined up approach. Working with us gives you confidence your dream home will be built on time and within your budget because you are working with experienced specialists. Turnkey is not a paid service, it is a way of working with one company handling everything to do with the build. You are not paying an extra fee for turnkey and opting for this solution tends to be more cost effective than doing it yourself or self-managing your project. By choosing turnkey to build your one-off bespoke home you don’t pay anything extra – there is no ‘service’ charge. As a turnkey company we handle multiple projects which enables us to pass on cost savings to our clients. We are confident that a professionally managed turnkey project will cost less than if the same like for like scheme had been self-managed. 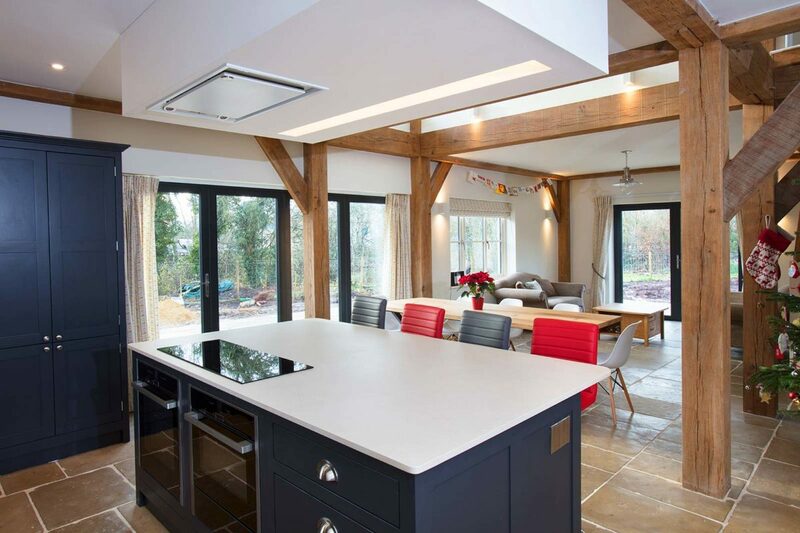 “Having decided on an oak framed house for our garden plot, we realised we were ill-equipped in time and knowledge to manage the project ourselves and were looking for a full turnkey service. We also wanted to know at the outset how much it would cost to determine its affordability and adjust the design accordingly. We found an oak frame company which claimed to offer the full turnkey service, but found ourselves being pushed through an illogical process with no consideration up-front for our budget, requiring us to make financial commitments which were unclear, and ultimately, being informed that it would be more cost-effective for us to arrange significant parts of the build ourselves than to use their services. We soon realised the project would be too expensive for us if we continued on this path. Extricating ourselves from our association with this company was very stressful and left us somewhat crushed and wary. How can you be sure turnkey is not a more expensive option? Cost is the biggest factor of any self-build project with many projects running into trouble because of it. It’s important every self-builder understands, from the outset, the true costs as there is a lot of conflicting information around. Let’s look at the facts. In 2017, most self-build costs were between £1,600m2 and £2,000m2 of usable floor area (gross internal area, GIA) for a fully completed home, ready to move in to. These figures hold true whether you are self-managing your build or using turnkey. The difference in cost comes from any design differences and the specification of the materials and products. These building costs are well evidenced and properly documented if you know where to find them such as the  Royal Institute of Chartered Surveyors. Many people use self-build publications and TV shows for information but these can be the source of hugely misleading information, setting self-builders off on the wrong path from the start. A recent example featured two homes – one an architect designed, self-build project with a well-researched cost plan, with build costs of £1,695 m2. The second, featured in an article on page 51 of the magazine covers a reader’s project. The house design is considerably more complicated, includes a basement, an oak frame and is built to a much higher level of specification which includes handmade tiles and bricks. So why the big difference in cost? Quite simply, the former has been properly costed by professionals. Why is this so important? It’s because of the high cost, financially and emotionally, to unsuspecting, aspiring self-builders! People embark on self-build projects believing their budget is reasonable, only to have their hopes dashed, often after they’ve spent money to get planning permission, or worse, get to the point of tendering their project. Some will have invested in building plots in the belief their budget stacks up. That assumption is not unreasonable based on the information available to them. This is just one of the reasons why turnkey can avoid nightmare scenarios like these. We take you through your project from start to finish, we focus on cost control and you know from the outset what your project will cost based on realistic figures. Our unique turnkey solution does not mean paying for things you wouldn’t have to if you self-managed the project. It does mean co-ordination, collaboration and rigorous attention to cost efficiency – you benefit from the buying power, expertise and experience of a well-established company. Our turnkey approach is unique and it’s the details that make all the difference – for example, we work with builders local to the site ensuring good value and keeping costs down avoiding potentially expensive travel costs. I’m a self-builder, I don’t want to lose control of my project. Our turnkey solution gives you the expertise and experience of a team of experts but we never lose sight that this is your build. We work closely with our clients throughout the process to ensure you are fully involved every step of the way. Our client’s both have full time jobs and a young family. Due to their busy lives, we handled the entire process using our full turnkey solution ensuring they felt they were in a safe pair of hands.